Bengaluru (also called Bangalore) is the capital of India's southern Karnataka state. The center of India's high-tech industry, the city is also known for its parks and nightlife. By Cubbon Park, Vidhana Soudha is a Neo-Dravidian legislative building. Former royal residences include 19th-century Bangalore Palace, modeled after England’s Windsor Castle, and Tipu Sultan’s Summer Palace, an 18th-century teak structure. An epitome of great architecture and beauty, The Majestic Bangalore Palace preserves in it the spice of old regal opulence. 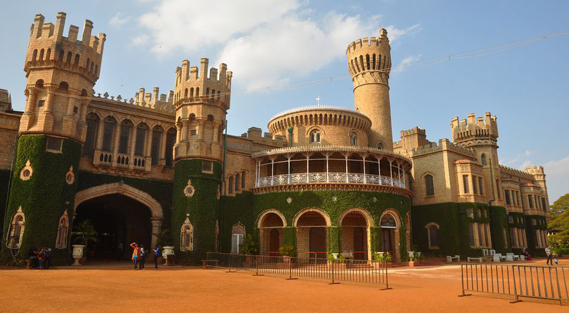 Currently the central attraction in Bangalore, the palace was built in the year 1878. Chamarajendra Wadiyar's British Guardians bought the original property in 1873 from the principal of Bangalore Central High School, Rev, J Garret, from his funds. The palace is extraordinarily vast and spread across 45,000 square feet. A mixture of Tudor and Scottish Gothic architecture have resulted into the grand palace that we see today.The wooden structure of the palace along with the beautiful carvings both inside and outside showcases the royal culture in different ways. Apart from being a major tourist destination, the palace is a host to different cultural events, rock shows, and marriages. As per beliefs, King Chamarajendra Wadiyar drew his inspiration for building the palace from the Windsor Castle of London. The granite seats decorated with fluorescent blue ceramic tiles on the ground floor, a fairy tale Ballroom, the famous painter Raja Ravi Varma's paintings, vine-covered walls, and the Durbar Hall on the first floor come together to form the prepossessing Bangalore Palace. A visit to the palace gives you a chance to witness the elegant and lavish splendour of one of the most powerful dynasties of South India. An audio tape is available inside the Palace, both in Hindi and English, to help the people having language issues, understand its history better. Spread over an area of 300 acres, Cubbon Park in the city of Bangalore is a major sightseeing attraction rich in green foliage. It is a green belt region of the city and is an ideal place for nature lovers and those seeking a calm atmosphere. Having been laid down by Lord Cubbon, the park is named so in his honour. It is home to more than 6,000 trees that support a vibrant ecosystem. In addition to being a natural sightseeing destination, some of the major structures of the city such as the Attara Kacheri, Cubbon Park Museum and Sheshadri Iyer Memorial Park are also situated here. Another famous attraction in the Cubbon Park is The Bangalore Aquarium, which is the second largest aquarium in India. Cubbon Park was originally spread over 100 acres, which was later extended to 300 acres. First established in the year 1870 by Sri John Meade (acting Commissioner of Mysore), Cubbon Park has a long history. Major General Richard Sankey (Chief Engineer of the State) conceived this park in honour of Sri John Meade. Initially, the park was called "Meade's Park" and later came to be known as the Cubbon Park. Since the introduction of the park, it was made and improved in many ways. In the year 1927, the park was officially renamed as "Sri. Chamarajendra Park" to mark the Silver Jubilee of Sri. Krishnaraja Wodeyar's rule in Mysore State. At present, the Cubbon Park is under the control of the Department of Horticulture. The Deputy Director of Horticulture (Cubbon Park) is responsible for the administration and maintenance of the park. Lalbagh Botanical Garden is located in Bangalore and is nationally and internationally renowned centre for botanical artwork, scientific study of plants and also conservation of plants. A haven for all nature lovers, Lal Bagh covers an area 240 acres in the heart of the city and has nearly 1,854 species of plants. It was commissioned by Hyder Ali in 1760 and completed by his son Tipu Sultan. The garden features rare plants of French, Persian and Afghani origin and has attained the status of a Government Botanical Garden. The Lal Bagh Rock which is over 3000 million years old is found here and is a major tourist attraction. This botanical garden, a delight for photographers, also consists of the famous glass house where an annual flower show is held every year and is also a home to an aquarium and a lake. Tipu Sultan brought in imported trees and plants from countries all over the world and planted them here and today, Lalbagh Botanical Garden has one of the world's largest collection of rare plants. In addition to being rich in foliage, this garden also houses a number of birds such as Myna, Parakeets, Crows, Brahminy Kite, Pond Heron, Common Egret and Purple Moor Hen. One of the busiest roads in Bangalore, MG Road or Mahatma Gandhi Road is a hub of recreational and commercial activity in the city. Swarming with people at almost all the time, MG Road is a one-stop destination for a perfect weekend shopping adventure. Items such as traditional handicrafts, silk, sarees and cutlery and bone china sets are easily available here among other enticing goods. And once you get tired of shopping and are looking for a quick bite to eat, a plethora of cafes and restaurants here are at your service. Nights at MG Road call for partying and dancing till you drop and it packs quite a few high-end pubs as well. One of the most popular shopping and entertainment hubs of Bangalore, MG Road is a must visit when you're in the city. It was known as South Parade during the pre-independence era but was renamed as Mahatma Gandhi Road or MG Road on 26th February 1948. Today, MG Road is best known for its amazing shopping experience, restaurants, cafes and food outlets offering delectable delicacies. With its own metro station now since 2011, MG Road runs east from Trinity Circle at one end towards Anil Kumble Circle at the other end. Once flocked with old buildings, today the avenue is all about fancy glass buildings mixed with an old vibe exhibited by few old-time structures. Take a stroll on the street and enjoy the bright atmosphere at MG Road! Located in the CBD (Central Business District), this luxury mall is the one stop destination for all your high-end needs. Assimilation of four towers as a whole, the mall is spread in a mind-boggling area of 13 acres. The place takes care of all your exclusive needs, whether it is shopping at some high-end store, or dining, or even taking a Spa after a hectic day of work, this place has it all. The place is home to all the luxury beauty and fashion brands from all around the globe, where LouisVuittonn, Estee Lauder, Rolex, Burberry and Canali are to name a few. The place covers all your needs, ranging from accessories, clothes, bags, shoes of exclusive jewellery by renowned brands from the world. Various events are also timely organised for all the visitors to experience the best of everything. Wonderla is said to be the best amusement park in the city (and also one of the best in the country), and attracts all those looking for a rush of adrenaline. While it is most famous for the high-thrill dry rides, it also features some relaxed, fun rides, hence providing something for every visitor. Situated on the outskirts of Bangalore on the Mysore road, Wonderla is a great amusement + water park, featuring over 60 rides. It's quite popular for its collection of "High-thrill rides", one of the main talking points of the park. It also features a newly constructed, India's first "reverse looping roller coaster" - a coaster which you do in both directions, once straight and once in reverse order. The water park is fantastic as well, with a variety of slides ranging from thrilling to the leisurely. Located 22 km away from Bangalore, the Bannerghatta National Park is an asylum for a large variety of flora and fauna. Spread over a massive area of around 104.27 sq. km, this national park was established in the year 1971. The park itself has a number of establishments within its confines, which includes the country's first butterfly park as well. Other attractions here are ten Reserve Forests of Anekal Range of the Bangalore Forest Division, an aquarium, a zoo, Children's park, Crocodile Farm, Snake Park, Prehistoric Animals' Park and a museum. What's more, you can get up close and personal with the wondrous wildlife here by the means of a jungle safari, which is a popular activity to pursue here. Nature lovers and photographers are surely in for a treat in the Bannerghatta National Park. The assorted collection of wildlife here includes elephants, leopards, jackal, fox, wild boar, sloth bear, India gazelle, spotted deer, porcupine, Asiatic Lion, Royal Bengal Tiger, monitor lizard and cobras. Rediscover the botanist in you as you inspect and learn more about the sandalwood, neem, tamarind, bamboo, eucalyptus and many more trees that find a place here. The various establishments here such as the zoo and the aquarium provide a number of experiences with the endearing wildlife here. Blessed with the bounty of nature, the Bannerghatta National Park is a unique learning experience for both adults and children alike. In addition to being a natural retreat, the park is also an unlikely destination for a wide variety of adventure sports such as trekking and hiking. All in all, Bannerghatta is a wonderful rendezvous with nature in its most unadulterated form. One of the largest lakes in Bangalore, the Ulsoor Lake is a magnanimous lake that is sprawled over an area of 50 hectares. Ulsoor lake was built by Sir Lewin Bentham Bowring, who was Bangalore's commissioner at that time. Dotted with a number of islands all along, the natural beauty of this destination is enhanced by the lush greenery that surrounds the lake. Owing to its natural beauty and calming environment, the Ulsoor Lake is frequented by picnickers and nature lovers alike. Ulsoor Lake is an important venue for the celebrations of Ganesh Chaturthi that take place somewhere in the months of August/September every year. A day out at Ulsoor Lake is abundant in a number of activities that can be pursued here. Sit back and relax the tranquil ambience of this place, or whip out your cameras and click a few shots of the endemic birds that call this destination their home. One of the most popular activities in Ulsoor Lake is boating, which is an amazing way to understand the landscape and revel in the charm of this destination. A weekend picnic complete with homemade snacks and a game of badminton is a must when you visit Ulsoor Lake! The Innovative Film City in Bengaluru is an Indian theme park located at Bidadi, just 40 kilometres away on the outskirts of the city, on the way to Mysore. One of the most popular tourist attractions in Bangalore, the place covers almost 58 acres of land. Whether you like to shop, eat, simply walk and explore or experience your childhood again; there is something unique that the Film City has to offer you. The Innovative Film City is broadly divided into three parts and is large enough for you to spend at least half of your day here- to walk around and enjoy all that the city has to offer. Step into the Innovative Attractions to enjoy amusement park rides and museums and enjoy the countless sections, such as Wild West Wind and Cartoon City; and the Innovative Studio to witness the world of movies and glamour. Visit the Innovative Style in between to enjoy shopping and gorge on cuisines from all around the world. A high-quality amalgamation of different themes, the Innovative Film City beckon to both: kids as well as grownups. So make sure that you visit this attraction with your family or friends when you visit Bangalore. Located in Rajajinagar area of Bangalore, ISKCON Temple is a revered shrine dedicated to Lord Krishna. The temple under the guidance of Madhu Pandit Dasa and was inaugurated in the year 1997 by Shankar Dayal Sharma. Apart from a religious shrine, ISKCON temple is a cultural complex accommodating dedicated deities of Sri Sri Radha Krishnachandra, Sri Sri Krishna Balarama, Sri Sri Nitai Gauranga, Sri Srinivasa Govinda and Sri Prahlada Narasimha. ISKCON Temple is known for its activities of engagement involving ardent devotees of Lord Krishna. The temple enrols members for life and arranges programs in their community centres for Krishna consciousness and awareness of the Lord. The temple community also organises songs and recitals admiring and praying to Krishna in public processions. Lectures and prayer services are regularly conducted here as well. In addition, the ISKCON temple community conducts a wide variety of activities directed towards rediscovering spirituality on an individual level as well as creating a spirit of harmony in the community. Described by Pandit Jawaharlal Nehru as 'a temple dedicated to the nation', Vidhana Soudha houses the State Legislature and the Secretariat of Karnataka and is one of the most popular attractions in the lively and colourful city of Bengaluru. It also proudly boasts the title of being the largest state legislative building in the country. With four entrances in all four directions and four floors above the ground level and one below it, we surely don't doubt the title. Popularly known as the 'Taj Mahal of South India', it is counted as one of the most magnificent buildings in the city and is sure to impress the onlooker with its sophisticated poise and glorified grandiose. The entire monument is illuminated on Sundays and public holidays and is a sight for sore eyes. Then Prime Minister Sri Pandit Jawaharlal Nehru along with then Chief Minister K.C. Reddy laid down the first brick of this establishment on 13 July 1951 and initiated the construction of a monument that symbolizes the legislative sovereignty of the people of the country. Its construction took a good five years and it was finally inaugurated in 1956 to become the largest legislative building in India. Constructed under the shadow of Sri. Kengal Hanumanthaiya's extensive knowledge and unmatched expertise, the Vidhana Soudha stands 150 feet tall and boasts of an elegant and truly exquisite Neo-Dravidian style of architecture. Looking at this magnanimous structure and staring into its unflinching prowess enlightens you of how the marvel is worth every single penny, and more, spent to build it. Located in the Central Business District of Bangalore, Commercial Street is home to a number of small shopkeepers and thrift shops which sell the most delightful variety of articles you can find. One of the first shopping areas a newcomer to the city is told about, Commercial Street is a fix for all your shopping needs and weekend entertainment. Needless to say, it is one of the most popular and visited shopping destinations in Bangalore. This destination is most famous for its variety of goods which range from street side markets to high-end stores. Whether one is looking for those Jimmy Choos or the local silk sari, chances are one will find it easily in many of the shops or the malls situated here. The lively atmosphere which is always abuzz with activity and the mad, mad rush of the local market make Commercial Street is every shopaholic's delight. A number of stores and market areas in Commercial Street have the most colourful variety of assorted goods readily available for their patrons. The famous Khadi Bhandar in dispensary road is a one-stop shop for metres of fabric in cotton and Tussar silk. At Dupatta House at Narayan Pillai Street here, one can get dupattas in every shade and even get them dyed. One may head to Pooja Collections for lovely silk dupattas, printed cotton and yards of Maheshwari. Lovers of silver won't be disappointed at several shops in Commercial Street, which have an extensive collection of exquisite pieces. In addition to indigenous shops, one will also find an exhaustive collection of showrooms such as Levi's, USPA and the likes. Jawaharlal Nehru Planetarium in Bangalore is a popular attraction site in the city, administered by the Bangalore Association for Science Education (BASE). The entire establishment is meant for the science enthusiasts and is devoted towards providing a detailed knowledge about earth and space and various scientific aspects of it in a fun and exciting way. From how stars form to how planets evolve, from the origin of life to human's space expeditions, from how gravity works to how eclipses happen - the planetarium tells it all. The Sky Theatre is its main attraction, but there are other interesting set ups as well which is fun to experience as well as gives an overall idea about a number of scientific phenomena. People from around the city visit this place as well as tourists who are in Bangalore for some days. Mainly it facilitates the educational institutes which can bring their students here for an academic excursion with prior booking. The children get to learn things outside the classrooms and also enjoy a day out with friends. The place is a fascinating hub of knowledge but not in a preachy, textbook manner; but rather in a much more intriguing and practical way which explains the concepts much better than simple words on a piece of paper. Situated about an hour and a half away from Bangalore, Nandi Hills is majestic trekking destination, roughly resembling a sleeping bull. It is a favourite among Bangaloreans for early morning drives to catch the sunrise, adventure sports, or one-day getaways to escape the hustle and bustle of the city. The small hillocks are a famous tourist spot, with a promise of a heavenly retreat into nature's abode. It is blessed with a pleasant climate throughout, its picturesque location featuring the misty mountains and the brilliant sunrise. The Yoganandeeshwara Temple which mounts the hill, with a stunning statue of Nandi (the bull) at its doorstep, grants the hills their name. With its attractions comprising of religious sites, Nandi hills is also a nature lover's as well as an adventure enthusiast's haven with the trekking and other activities amongst the dewy hillocks and exotic flora and fauna. Go-karting is an adrenaline pumping activity best for those who are racing enthusiasts. The activity involves driving a vehicle called the go-kart for a particular distance or a limited number of laps. This vehicle is a small four-wheeled machine behaving like a car with only one passenger seating. Simulating the thrills of professional racing on a smaller level, this activity will set your heart on pace and will thrill you to the fullest. The go-kart comes in various sizes with an option of motorless mode as well. Most of the places offering the go-karting facility also offer other recreational activities such as bowling or paintball. Some of the go-karting places in Bangalore include Grips Go Karting and Bowling, Race-Race Gokarting, E-Zone Club, Patel Karting and other. What's more, you can challenge your friends and family to a friendly battle and establish your driving dominance over them all! Chunchi falls, is an almost 50 feet high cascade of falls, which is fed by the river Arkavati. Chunchi Falls lies en route to Mekedatu and Sangama. Mekedatu is a rocky valley, while Sangama is the meeting point of three rivers. It is considered to be one of the most beautiful waterfalls near Bangalore; with routes adorned with lush greenery and gorgeous scenery. It is placed at around 83 km from Bangalore and offers a breathtaking experience; especially after monsoon and during winter months. This spot is extremely popular as a picnic spot. It derived its name from a tribal couple, Chuncha and Chunchi. These falls are a perfect way to escape the grind, as they are tucked away from the commercialisation and are usually deserted. On the way to Chunchi Falls, travellers also come across a watch tower which enables them to devour a panoramic 360-degree view of the scenery around. The rocky terrain adorned with deciduous forest and the enchanting waterfall is undoubtedly a sight to behold. If you are an adventure junkie, then you can trek all the way down to the falls to soak in the beauty of the surroundings. There is a power station ahead of Chunchi falls. Chunchi falls had a lot of water before the installation of this power station. However, after the installation of the power station, the amount of water has reduced significantly in the Chunchi falls. One should not try to step closer to the falls; as it might be risky and dangerous. Chunchi falls witnessed accidents before. Hence, staying here until late evening is not advisable. As when the place is deserted, the chances of mishaps are high. Swimming is also prohibited here due to the strong undercurrents and presence of crocodiles. This temple is considered as one of the most beautiful shiva temples around the country. The beautiful statues of Lord Shiva and Lord Ganapathi are a major attraction for all the devotees visiting the temple. The temple is known for its well-maintenance and regular festivities being organised for the devotees for them to indulge in the worship of Lord Shiva, who is considered as one of the major gods in Southern India. Marked by a 65ft tall figurine of Lord Shiva carved in white marble, and placed in an artificial pool of water symbolising Lord Shiva's natural habitat, this place is a beautiful pilgrimage centre for all the devotees of Lord Shiva. Lord Ganapathi is also worshipped in the premise of the temple and regular aarti and chanting of mantras are done by the priests. Located in Cubbon Park, the Bangalore Aquarium is the most famous and largest aquarium in Bangalore and the second largest in India. Established in the year 1983, this aquarium has on display a variety of ornamental as well as exotic fishes including Siamese Fighters, Catla, Freshwater Prawns, Goldfish, Red Tail Shark and many others. It is an ideal place for casual exploring in Bangalore. It is a diamond-shaped building, spread over three floors. While the first floor has 14 tanks, the second floor has 69 tanks of various cultivable fishes and other aquatic flora and fauna. The various fishes that can be seen at the aquarium are eels, angelfish, hockey stick tetra, red-tail shark, pearl gourami, goldfish, moon tail among others. Located at the juncture of Albert Victor Road and Krishna Rajendra, is the magnificent accommodation of the valiant ruler of Mysore- Tipu Sultan. The palace is located in the Bangalore Fort which is situated in old Bangalore in the south-west Indian state of Karnataka. An exquisite example of Indo- Islamic architecture, the opulent palace was once used as a summer retreat by the king and was often referred to as the 'Abode of Happiness' and 'Rash e Jannat' meaning 'Envy of Heaven'. Amongst one of the most noteworthy creations of the ancient times, the palace boasts of ornamental frescoes, magnificent arches, protruding balconies and brilliant motifs. One can take a good leisurely stroll across the balconies before entering the palace. One is bound to get a glimpse into the royal lifestyle of Tipu Sultan as they explore the palace. The construction of the fort started during the reign of Hyder Ali and was completed in 1791, during the rule of Tipu Sultan. Among the several unique aspects of the two-storeyed palace are its huge wooden pillars, glorifying brackets and its all- around idyllic and placid setting. After the death of Tipu Sultan, the British used the monument for its Secretariat until about 1868, before moving to Attara Kacheri. Blessed with lush green gardens, flowering shrubs and sparkling fountains, the palace is an attractive tourist site and a slice of solitude in the heart of the city. Lately, a small part of the fort has also been converted into a museum showcasing various events of the life and times of Tipu Sultan. Once tourists enter the fort, they are bound to feel like they have entered a different place and a different era altogether. The palace has a serene vibe that will make one feel at peace the moment they walk in. The Bull Temple, also known as Nandi Temple, is one of the oldest temples in the city of Bengaluru. The temple is popularly called as 'Dodda Basavana Gudi' by the locals and is the biggest temple dedicated to Nandi in the world. Nandi, the bull, is the mount or 'vahana' of Lord Shiva and the guardian deity of Lord Shiva's abode, Kailashagiri; according to Hindu traditions. This temple is every Shiva devotee's must-visit destination because Nandi holds great importance to Lord Shiva. The architectural style of the Bull Temple is mainly Dravidian and was constructed by Kempe Gowda. It is believed that the origin of the river Vrishabhavati is at the feet of Nandi. The entire sculpture of the bull is carved out of one single granite rock. The statue is 4.5 meters high and 6.5 meters long. Coconut oil, butter and 'benne' are regularly applied to this statue. This had led to the originally grey statue to turn black. On the premises of the Bull Temple, there is also a beautiful temple of Ganesh, the beloved son of Lord Shiva. An interesting fact about this temple is that the statue of Lord Ganesh is made entirely of butter! It takes about 110 kilos of butter to make this artistic statue, and a new statue is made every four years. What is really astonishing and noteworthy is that in the four-year tenure of each butter sculpture, the butter doesn't melt or change shape even once. The butter that makes the statue of the deity is then distributed to the devotees as prasad. In the midst of the hustle and bustle of the busy city that Bangalore is, Lumbini Gardens is a quiet getaway to relax the mind and have fun with family and friends. Lumbini Gardens is a public park on the banks of the Nagawara Lake in Bangalore, Karnataka named after Lumbini of Nepal. It is dedicated to Lord Budhha. Although the garden is mainly a national park, it is a treat to the eyes with its serene landscapes and lots of greenery. Located near the Nagwara lake, the Lumbini garden is one of its kind garden attraction of Banglore. The garden garners plenty of visitors everyday of the week. The beautiful serene environment of the lake hosts the visitors with mesmerising view and activities that people come to enjoy with their loved ones. The Lumbini Gardens is a very beautiful kid's park and has a boating club which the visitors enjoy very much. Apart from all these the garden has beautiful fountains and a stretch of 1.5 km to walk through with a view of the lake and gorgeous greenery on the other side. The garden also houses some beautiful statues and a host of rare plants. At night, the garden is illuminated with various lights which is a pleasure to see. And guess what? That's not all! The Lumbini garden is also known for the food stalls and famous eateries nearby. Undoubtedly, Lumbini garden has made its place among the crowd's favourite weekend destinations. HAL Aerospace Museum is one of the major public attractions of Bangalore. Inaugurated in 2001 at the Hindustan Aeronautics Limited premises, the museum was established with an objective of educating the public about everything the journey of HAL, one of Asia's largest and most important aeronautical companies, had to offer - be it historical, scientific or academic. On the one hand, the museum proudly boasts of the giant leaps Indian aviation has taken, both commercially as well as in terms of defence; and on the other side, it gives the visitors an all-inclusive aerospace experience in the most effective environment possible. No other place matches this in terms of being equally demonstrative in theory and practice, both. The museum makes sure that the visitors get the best possible insight into the aeronautical history of HAL and of India - its experiments, achievements and possibilities; and at the same time, they also get to have a glimpse of some of the most powerful possessions of the Indian Air Force. Such an exhibit is an enchanting experience not only for the aviation enthusiasts but also for the layman. At present, the HAL Heritage Centre and Aerospace Museum together form the most massive aeronautical complex of South Asia in terms of production, maintenance, development and exhibition of fighter and commercial aircrafts, helicopters and all their engineering parts and accessories. The Wood Street is known for its restaurants and pubs. It also has some of the best tattoo studios in the city. A roof top restaurant with cozy settings and ideal for a relaxed evening in the city. Outskirts of Bengaluru are a cyclist's delight. One can rent a cycle from the multiple cycle groups available here such as Namma Cycle, Bums on the saddle, Bike Zone etc. Bangalore is a paradise for all the people looking to shop in the city. From high-end luxury malls to local thrift shops and street market, this place deals with everything one might need, with a budget which suits everyone's pocket. From beautiful clothes to ethnic south Indian Jewellery, to beautiful handicraft items and to local spices and condiments, there is absolutely nothing you won't find here. Bangalore has a wide variety of things to offer for the people who visit the place. Lanes are filled with shops containing all kinds of stuff and ever so lively with all the activity happening around. Beautiful Silk sarees are something one should look forward to buying while in the city. There are various factory outlets, wholesale markets and thrift shops one can head to if they wish to buy amazing products at a steal deal. Branded luxurious store are also available in the city if one wishes to shop there. A recent addition to the temples of Bengaluru, this one houses a library with a sprawling collection of texts and books on Buddhism and is constantly the hub of a number of spiritual retreats and lectures. The setup conducts teachings on Dharma and meditation retreat on specific days of the month. St. Mary's Basilica is the oldest church in Bangalore and is the only church in the state that has been elevated to the status of a minor basilica. It is famous for the festivities it holds during the St. Mary's Feast, in September each year, an event which attracts a large number of devotees from in and around Bangalore. It is a marvelous sight to behold with its towering façade, glass windows and the loving statues of Mother Mary. It is a generous throwback to the colonial era of Indian history and restores the traditional faith of Christianity till date with elaborate feasts, masses done in different languages and the annual celebration of Mother Mary's nativity day. St. Mary's Basilica is a spacious gothic-style Church built in the form of a cross, designed by a French architect. It is 172 feet long and 50 feet broad. The imposing and magnificent tower forming the facade of the Church is 160 feet in height. A beautiful statue of Mother Mary holding Child Jesus in her arms, 6 feet in height, is set up in an attractive shrine just outside the Church building. It is the chief object of veneration and a source of inspiration for the people. Every day, Our Mother Mary is draped in a saree, which is the typical dress of an Indian lady. It is said that in 1875, when the new Church was built, people tried to remove this statue to install it on a prominent altar inside the Church, but they failed in their effort since the statue remained immovable. This strange happening is considered to date a sign of Our Lady's miraculous power. The Main Feast of the Church is celebrated with all grandeur on the 8th of September, the Feast day of the Nativity of Blessed Virgin Mary, every year. This feast is considered one of utmost importance by the people, in the whole of the Archdiocese and the state of Karnataka. Sankey Tank is is a manmade lake, situated in the western part of Bangalore. Spread across an area of 37.5 acres near Vyalikaval, Malleshwaram and Sadashivanagar, it is one of the most popular places to hang out in Bangalore. Sankey Tank is a perfect place for nature lovers who can enjoy stress-free moments in the refreshing and calm surrounding. This large body of water is a source of attraction for not only locals, but also for the tourists coming to Bangalore. The State Forest Department takes care of the lake. This artificial tank was built in the year 1882 under the administration of Colonel Richard Hieram Sankey of the Madras Sappers Regiment. This tank was built in order to cater the water supply demands throughout Bangalore City at that time. It was also called Gandhadhakotikere at that time as the Government Sandalwood Depot was situated near it. Located 21 kms southwest of Bangalore on Kanakpura Road atop Panchagiri Hills, Art of Living Centre is the headquarter of the spiritual, cultural organization Art of Living Foundation, established by Sri Sri Ravi Shankar. Constructed in 1986, the ashram focuses at creating a stress-free society through its multitudinous programmes which include yoga, meditation, Ayurveda treatments etc. The magnanimous campus housing several mini gardens, tiny water lake and abundance of trees is popularly called the ?Bangalore Ashram? and draws over 1.2 million people from across the world annually. The centre is considered a retreat from the stress and din of the city and provides the much needed therapy and solace from city blues. Set in a tranquil backdrop with pretty winding paths to walk on, amidst flowering gardens and a sparkling lake, this ashram provides the much needed respite from the strain and monotony of the regular routine. Art of Living Centre aims to unite people and help them reflect on their lives and privileges through meditative programmes, satsangs and spiritual talks while keeping them in between nature. It also has to option of Seva which is just voluntary work you can do to attain the satisfaction of the mind. The daily routine involves yoga, chanting and meditation to calm the mind, satsangs to light up your spirits and numerous customized courses that you can take up for your peace. The ashram is an ideal location not just for followers but also for nature lovers and all you people seeking seclusion, solitude and spiritual bliss. Located on the Kasthurba Road in Bangalore, Visvesvaraya Industrial and Technological Museum was built in the honour of Bharat Ratna recipient Sir M Visvesvaraya. Spread over an area of 43000 sq. ft., the area is built in the sylvan surroundings of Cubbon Park and was inaugurated by the first Prime Minister of India- Pandit Jawaharlal Nehru, in 1962. The first ever gallery exhibition displayed by the museum was based on the principles of “Electricity” and was open to public visit on the 27th of July, 1965. Designed on the theme of a “Science Museum”, the museum houses four floors dedicated to a scientific discipline each, with the topmost floor converted into a food court. The outstanding deco of the depository has been inspired by the ancient scientific tools and machinery like Wright Brothers' Kitty Hawk, flying Stimulator and other similar objects. The backdrop shows surreal pictures and animations of changing the climate, various sea and land dynamics and different planetary positions. The centre has seven permanent gallery displays consisting of copious exhibits of a steam engine, aeroplanes, motor power etc. In addition to this, the museum has a virtual gaming zone, a tiny planetarium and a 3D visual display centre for recreation. The centre aims to promote the importance of science in everyday life by its interactive demonstrations and by conducting experiments. Built in 1972, Ragigudda Sri Prasanna Anjaneya Temple is dedicated to the very celebrated Hindu God- Hanuman for his unconditional divinity and devotion towards Lord Sri Rama. Located on top of a quaint hillock in 9th block of Jayanagar suburb in Bangalore, the temple houses a Shivaling in addition to a huge gorgeous idol of Hanuman and beautiful shrines of Ram, Sita and Lakshman.Spread over a vast area of 5 acres, the temple complex boasts of a beauteous water tank called the Pushkarni, an auditorium, a tiny Prasad division and an amphitheatre. It also flaunts an artificially created waterfall which prettifies the already enchanting hill top view. The temple has gained immense popularity in the last few years and has become an important tourist attraction of the IT city. The foot of the shrine also has tiny temples of Lord Ganesha, Rajarajeshwari, Devi and Navgrahas. Ragigudda Anjaneya Temple also has a charitable front which helps the unprivileged and those in need and care. The most important festival of the region is the Hanuman Jayanti, which is a 12- day long festival and is a grand event, celebrated with a lot of zeal and fervour. Located in the premises of Karnataka Government Museum, Venkatappa Art Gallery situated on Kasturba Road, Cubbon Park flaunts over 600 paintings. Named after the most famous artist of Bangalore city - K. Venkatappa, the gallery houses resplendent works of the namesake painter and other renowned artists as well. Sprawling over a vast area, the two-storeyed museum is further divided in different galleries some of which display antiques from the Indus Valley Civilization, paintings from the Hoysala, Gandhara and Nolamba periods, exquisite wood carvings, phenomenally carved sculptures, specimens of geology and art, ancient musical instruments and the like. Some of the rare artworks displayed are dated back to 2000 BC. Venkatappa Art Gallery is an insight into the glorious past with its umpteen exhibits and displays. The first floor of the museum houses incredible works of Venkatappa himself which include the very famous painting of the Ooty sunrise, the dazzling Nilgiri hills, a scenic Church Hill view etc. Other artists featured along with him are M. F. Hussain, Vasudev, Hariram, Rekha Rao, Yusuf Arakkal and N.S. Bendre. The second floor is solely dedicated to the paintings of K. K. Hebbar. The rich collection showcased in the gallery attracts not just art and history buffs but people from all over India day in and day out. Located in the suburbs of Halasuru (Ulsoor) in Bangalore, Halasuru Someshwara Temple is dedicated to the Hindu deity Shiva. Dating back to the Chola period, the temple is the oldest in all of Bangalore. Built in around the 12th and the 13th centuries by the Hoysalas, the temple is now managed and maintained by the Endowment Department of the Karnataka government. However, major modifications and additions to the temple were made during the Vijayanagar empire. Besides the several other notable features of the temple, the most fascinating are the elaborate sculptures of Ravana holding the Kailash Parvat to please Lord Shiva, Goddess Durga slaying Mahishasura (a demon), scenes from the wedding of Lord Shiva and Parvati, images of the Saptarishis etc. Constructed in the Vijayanagar style of architecture, the shrine has notable beautiful carvings on the walls and placid interiors. Other than the main temple, the premises are dotted with smaller shrines of other deities including Kamakshamma, Arunachaleswara, Bhimeswara, Nanjundeswara and Panchalingeswara. The temple is one of the most popular places of attraction in Bangalore and is especially flocked by a significant number of tourists at the time of Mahashivrathri. The devotees believe that the Hindu gods Brahma and Vishnu also worshipped in this temple. Known for its historical significance and archaeological brilliance, Devanahalli Fort is located 35 kms north of the city of Bangalore. The fort is a living example of the extensive battles fought and won and of the royal families. Lately in ruins, the fort once was the birthplace and residence of the great warrior Tipu Sultan. Sprawling over a vast area of 20 acres, the building is essentially made of stone and mortar. Originally built in 1501, by the Mallebyre Gowda during the reign of Saluva Dynasty, until the Dalwai of Mysore Nanjarajaiah occupied it in 1749. Later it was taken over by Hyder Ali before finally being passed on to Tipu Sultan. The fort boasts of twelve semi-circular bastions, each with a gun-point view and a spacious battlement. The entrances, though relatively small are decorated with cut- plasterwork, and the main attraction is the chief residence of Hyder Ali and Tipu Sultan. The memorial is a six foot tall enclosure with pillars. The fort is currently a residence for many as several families inhabit the place. Among the umpteen temples located inside the premises of the fort, Venugopalswamy is the oldest with impeccable architecture and houses several attractive idols of local deities. Other than that, there is Siddheswar Swamy temple, Raghabendraswamy Math, Chandramouleswar Temple etc. Though in a dilapidated and crumbling state with most of the walls covered in graffiti, the fort manages to retain some of the yesteryears’ grandeur and glory. We recommend you to visit the fort if you like old monuments and archaeological places. Created in 1995 by B. N. A. Technology Consulting Limited, Hong Kong, Indira Gandhi Musical Fountain is probably the most technically advanced and one of the biggest artificially created fountains in India. Located on T. Chowdaiah Road, the enthralling fountain has been based on multimedia technology, MIDI interfaces and hardware architecture. The magnanimous fountains surrounded by pleasant lush gardens hosts two nightly light and sound shows per day. The show together with rhythmic dancing of the sparkling water is an enchanting site. The landscaped park is maintained by the Department of Horticulture and includes a play garden for kids. The entrance also houses a dummy train engine in the honour of the then Chief Minister C. K. Jaffer Sharief, who then got the fountain constructed. All in all, the fountain park is an asset to not only Bangalore but all of India. It is believed that with very little modification, the park can surpass the techniques and designs of many foreign attractions. The Big Banyan Tree or locally called as the Dodda Alada Mara is a 400 year old banyan tree in the village of Kethohalli near Bangalore. Sprawling over a vast 3 acres of land, the tree is one of the largest of its kind. In the 2000s, the tree got infected with a natural disease and the chief roots died of contamination. Ever since, the giant tree looks like an amalgamation of several smaller trees, with its roots still multiplying in number and size. Awning with at least a thousand aerial roots, Alada Mara covers a circumference of more than 250 metres. The humongous tree is a scintillating example of nature’s marvels. Tourists from all over India gather here just to soak in the impeding sunlight amidst the labyrinth of its enormous roots. The tree has also been believed to symbolize the holy trinity of the Hindu gods- the roots, stem and branches represent Brahma, Vishnu and Shiva respectively. Over the years, the big Banyan tree has been a witness to the state’s development, and is maintained and managed by the horticulture department of Karnataka. The area has been fenced, has neat little pathways and brightly painted cement seats and has become one of the most popular tourist attractions of Bangalore. Located in the restored heritage Manikyavelu Mansion on 49 Palace Road Bangalore, National Gallery of Modern Art was inaugurated very recently on 18th of February, 2009. The main museum is situated in the Jaipur House, New Delhi, Mumbai and Bangalore being the subsequent branches of the same. Housing over 14,000 incredible works of contemporary and modern artists, the top notch collection include spectacular paintings and sculptures from Raja Ravi Verma, Jamini Roy, Amrita Sher-Gil, and Rabindranath Tagore. The premises, spread over an area of 3.5 acres boasts of lush green gardens with brightly blooming flowers and is a perfect blend of modern architectural designs and the poise of the past. The two storeyed museum based in the colonial style residential building (former summer home for Raja of Mysore) spans across enormous halls, has brightly lit, airy rooms featuring some of the best works of the bygone era. The depository showcases cultural ethos of India from periods as early as the 18th century. The huge windows allow ample sunlight to enter the rooms in addition to offering a picturesque view of the grassy lawns on the outside. Facilitated with a huge auditorium, a charming cafeteria, and a reference library, the art gallery is a hub for historians and art lovers.